The internet of things (IoT) is transforming business across every industry, from healthcare to energy to retail, and the opportunities seem endless. In fact, by the year 2020, it’s estimated that manufacturers will invest $70 billion on IoT solutions, more than double their spending in 2015. Here at Microsoft, we’re focused on helping our partners and customers in all industries seize IoT opportunities. 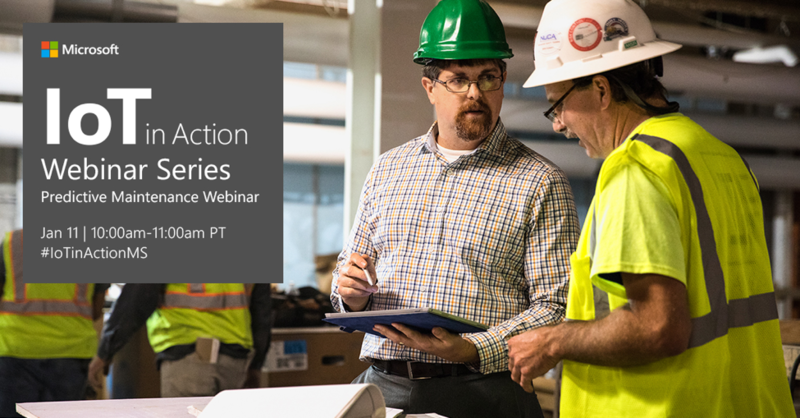 That is why we’re hosting a new IoT in Action webinar series. Starting in January, we’ll tackle IoT topics from a different industry perspective each month. Our first delivery is all about IoT-enabled predictive maintenance for equipment manufacturers and how artificial intelligence (AI) technology can help you prevent equipment failures, boost product quality, and ultimately, drive profit. Attend the webinar on January 11, 2018 to learn more. Wouldn’t it be nice if you could be alerted to equipment failures or maintenance issues before they happen? Thanks to IoT-enabled predictive maintenance, that’s now a real possibility. Predictive maintenance is an application that aggregates environmental, process, and resource data and uses AI and machine learning to analyze and predict when an asset needs to be maintained or replaced before a failure occurs. Predictive maintenance gives manufacturers real-time visibility into the health of their equipment and processes—even their deployed products. Sensors monitor components, serve up real-time data via digital dashboards, and send automatic alerts when attention is required, along with specific steps to be taken. Predictive maintenance enables manufacturers to easily track whether parts arrive at the plant floor as expected. They can set rules to optimize equipment use and plant management based on demand or environmental data, such as noise or vibration. Manufacturers can also use pattern-based anomaly detection to predict when and where quality issues may occur ahead of time. Increased quality: Improve products and processes through machine-learning and detect maintenance issues early to increase customer satisfaction. For a great example of how IoT-enabled predictive maintenance can transform business, let’s look at a steel manufacturer with multiple plants in India. Each plant has multiple arc furnaces that use water cooling panels for temperature control. However, leakages in the panels were causing safety issues as well as production losses. To resolve this issue, the manufacturer worked with Happiest Minds (a Microsoft partner) to build an Azure-based IoT solution that remotely monitors the panels, detects anomalies, and performs root-cause analysis. The implementation of predictive maintenance has prevented failures and production delays throughout the plants while helping ensure employee safety. In another example, aircraft engine manufacturer Rolls-Royce implemented predictive maintenance on the Azure IoT platform to help their customers reduce costly flight delays caused by engine maintenance issues. Each of their 13,000 engines in operation worldwide has thousands of sensors that monitor engine components and deliver insights around fuel efficiency, engine performance, and operational efficiencies. These insights enable Rolls-Royce to anticipate maintenance needs and avoid costly, unscheduled delays. Join me, along with Sudhama Vemuri from Happiest Minds and Neal Meldrum from Microsoft, for our first IoT in Action webinar on January 11, at 10 AM PST. Together, we will explore the topic of “Predictive Maintenance for Equipment Manufacturers” and how today’s AI technology can ensure equipment uptime and boost equipment reliability. Register today for this free, 60-minute webinar. If you’re interested in the IoT in Action in-person events, you can learn more here.